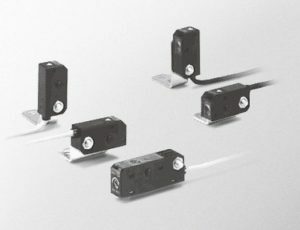 HPJ Series Ultraminiature Photoelectric Sensors with Self Contained Amplifier. The HPJ ultraminiature sensors have a self-contained amplifier in a fingertip size profile. These units have long distance scanning capability and a full range of slit attachments. They are available in both horizontal and vertical mounting configurations that come prepackaged with the proper brackets. Available in both NPN and PNP versions.